Create a social network for your customers and employees that's tailored specifically to your store. CornerVine lets your customers and employees add each other as friends so they can keep track of what everyone in their network is drinking and rating. Leverage your employees' expertise by encouraging your customers to add employees as friends so they can see what your product experts have to say about what's available in your store. Using optional email notifications and native mobile app push notifications, your customers and employees can be notified immediately when someone in their network has added a rating or tasting notes. Alternatively, users can set a schedule so that they receive all the ratings and notes from all their friends on a daily, weekly, or monthly basis. 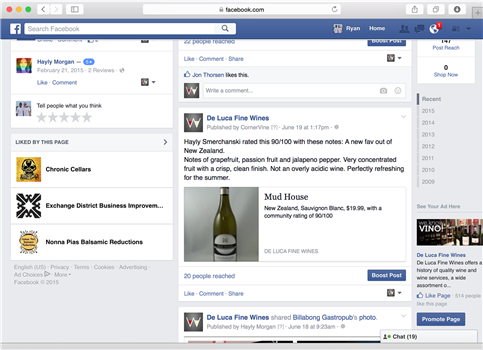 Let your customers post their ratings and notes into their timelines for their Facebook friends to see. Allow your employees to post their ratings directly to your store's Facebook Page, making those posts visible to any Facebook users who have "liked" your page. Automatically post new events from the CornerVine Events tool directly into the Facebook Events tool for your store's Facebook Page. 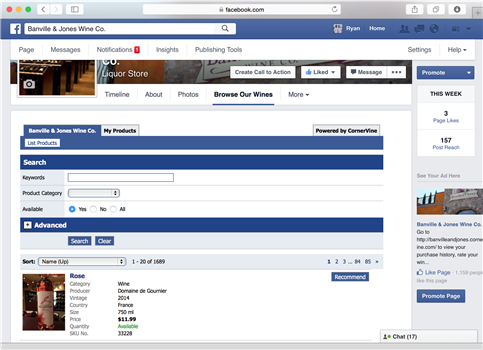 Allow Facebook users to browse and search your entire product offering without leaving your Facebook Page. 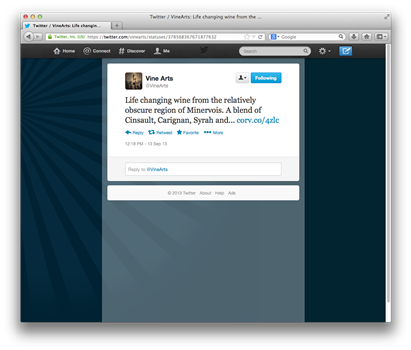 Let your customers post their ratings and notes directly into their Twitter feeds for their Twitter followers to see. Allow your employees to post their ratings and notes directly to your store's Twitter feed, with a shortened link directly back to the product details. Automatically post new event announcements directly into your store's Twitter feed with a link to your CornerVine site for more information.